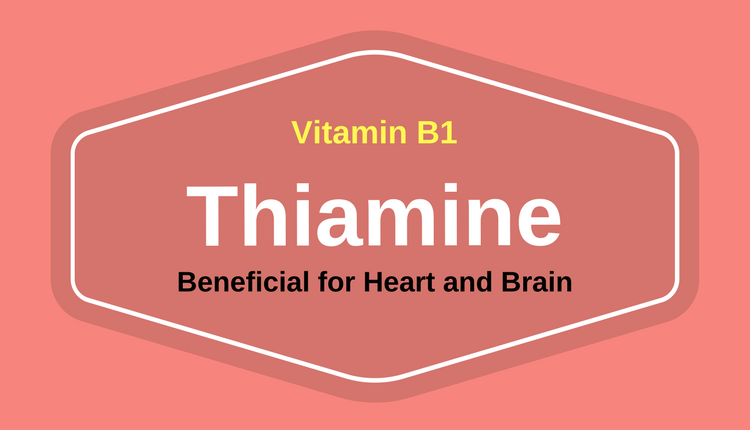 Thiamine or vitamin B1 is an important water-soluble B-complex vitamin that plays an array of essential roles in the body. It helps in maintaining a healthy heart, improving memory and cognition and protects the brain and nervous system against damage. Thiamine is also required to produce energy which the body needs to carry out various functions. It enhances the health of skin, mouth, gastrointestinal tract and eyes. Thiamine also fights depression and anxiety disorders and boosts mental health. Studies have discovered that thiamine deficiency is common in individuals with diabetes. Getting enough thiamine counteracts damage to the small blood vessels which is otherwise common in diabetics due to chronic high blood glucose level. Deficiency of thiamine impairs glucose metabolism in people with diabetes mellitus. When foods high in thiamine are added to the diet of diabetics, the activity of enzymes, which play a positive role in glucose metabolism is enhanced. Thus, it delays the progression of diabetic complications. Furthermore, thiamine-rich foods are high in dietary fiber too, which slow down the release of glucose into the bloodstream and help in the management of diabetes mellitus. Thiamine improves general well-being in patients with anxiety disorders. This water-soluble vitamin reduces anxiety, improves mental clarity and helps the brain and body to work effectively in individuals with generalized anxiety disorders. Thiamine helps the mind to relax, allows one to get a good night’s sleep and decreases fatigue. It is a natural stress-buster and boosts healthy nerve function. One can keep anxiety and panic at bay by increasing their regular intake of thiamine. Acetylcholine is a brain chemical that is important for processing of learning and memory. This brain chemical is reduced in individuals with Alzheimer’s disease. Your brain needs thiamine to produce acetylcholine. Therefore, an adequate supply of thiamine is required for a healthy brain. Studies have revealed that thiamine plays an important role in mental health and a positive link has been found between low thiamine nutritional status and depression. Thiamine provides glucose to the brain, which is a vital fuel required for its functioning. Furthermore, thiamine is needed for the secretion of serotonin, a chemical that boosts mood, appetite and overall well-being. Thiamine deficiency has a negative impact on the central nervous system. Thiamine helps in the development and strengthening of myelin, a substance that surrounds the nerves and protects it against damage and death. Thiamine helps in the breakdown of macronutrients and converts them into energy. It further helps move this energy into cells and tissues where it is required for proper digestion of food. This speeds up metabolism and helps in regulating appetite. Thiamine also helps in the secretion of hydrochloric acid (HCl), a liquid present in the stomach required for the complete digestion of food. Eating thiamine-rich foods can promote good digestion and reduce the risk of digestive problems. Studies have confirmed the beneficial impact of thiamine intake on heart health. Treatment with thiamine showed improvement in echocardiograms in individuals suffering from congestive heart failure. This proves that thiamine is effective in preventing heart diseases. Evidence-based studies have found that thiamine improves metabolism, regulates appetite and prevents the onset of gastrointestinal disorders. A diet rich in thiamine protects vision and prevents glaucoma and cataracts. Such a diet further prevents damage to the skin and fights aging. Thiamine also enhances production of energy and boosts stamina.